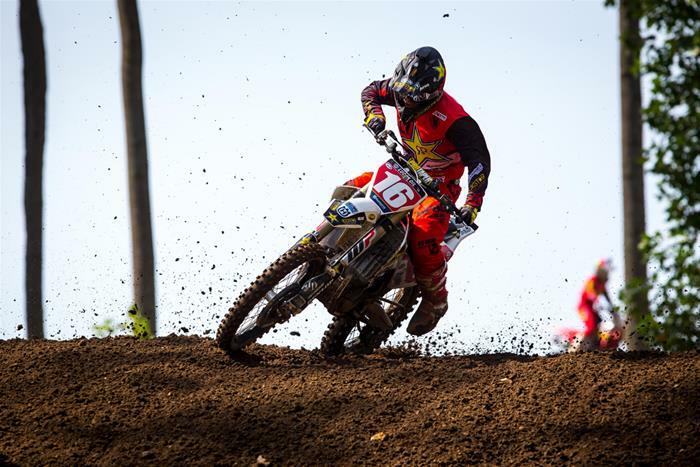 (Crawfordsville, IN) – The Rockstar Energy Husqvarna Factory Racing Team finished up an impressive AMA Pro Motocross season on Saturday at the Ironman National in Crawfordsville, IN by claiming another overall victory in the 250 class. 250 rider Zach Osborne has already won the championship, but he put the cherry on top by going 1-1 to earn the final 250 overall victory of the season. 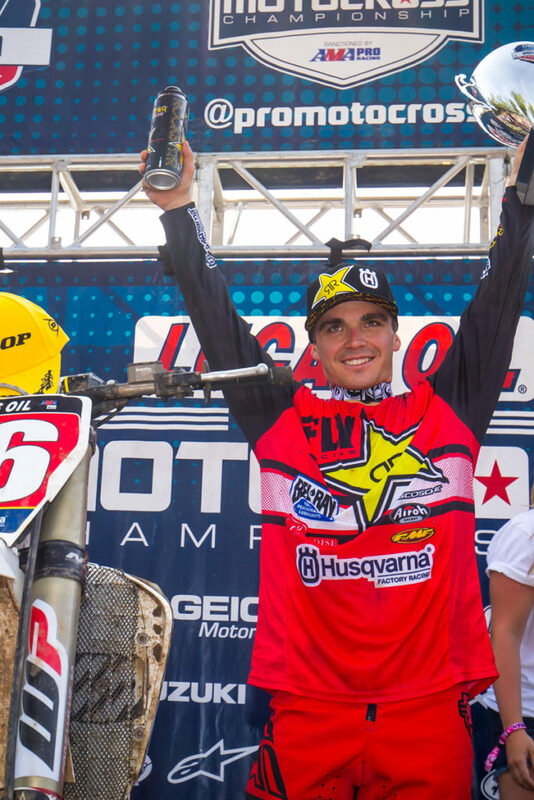 Teammate Dean Wilson battled the flu all day but conquered his goal of finishing a strong season. He went 12-10 for 10th overall. Zach Osborne was second at the start of the first 250 moto and came out of the first lap in third. He navigated his Husqvarna FC 250 back into second the following lap and was within striking distance of the leader. He stayed on the charge for nearly 20 minutes before getting it done with an inside pass for the lead on the ninth lap. 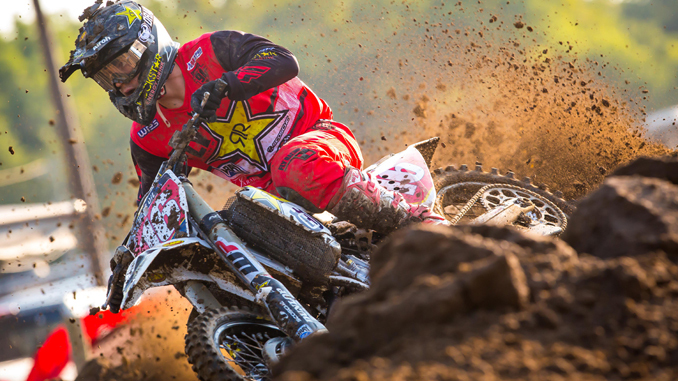 Not backing off the pace, he stayed in control and claimed the first moto victory of the day. He was top-three at the start of the second moto and immediately started battling for the lead. He was second at the end of the first lap and was right on the heels of the leader. After stalking the leader for over a lap, he made an impressive inside pass right after the finish line to overtake the lead. He held strong to the finish to go 1-1 and earn his fifth overall win to end his championship-winning season on a victorious note. Dean Wilson, battling the flu, was mid-pack at the start of the first 450 moto and ended the first lap in 16th. He made his way up to 13th by the third lap and continued to charge, making one more pass to finish 12th by moto’s end. He was top-five at the start of the second moto, but fell back to 12th by the third lap after a mistake. Never one to quit, he continued to dig deep to get to 10th by the finish. The 12-10 scores gave him 10th overall on the day, and finished the season an impressive 4th in 450 rider point standings. Husqvarna Motorcycles North America, Inc.
Husqvarna has continued to expand its professional race team to compete in AMA Supercross, AMA Pro Motocross, AMA National Enduro, GNCC, AMA EnduroCross, and AMA National Hare & Hound championships. Husqvarna team riders are competing aboard 2015 Husqvarna FC 450, FC 350, FC 250, FE 350, TC 250 and TE 300 models.